This is the longest standing house of the British Province being founded in 1926 when brothers from Ireland arrived to re-establish the Carmelite presence in Britain with the hope of re-founding the Province of the Assumption which had disappeared at the Reformation. Because it was close to Aylesford Priory the Order accepted Faversham, even though at the time there was not enough income even to feed the community. Today there is a thriving, lively parish dedicated to Our Lady of Mount Carmel next to which is the National Shrine of Saint Jude, Apostle and Martyr, which is also served by the Carmelite community. 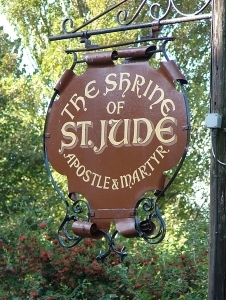 A part of the shrine ministry is a newsletter which reaches some 19,000 people four times a year. As well as serving the parish and shrine the community are involved in school chaplaincy, media and writing, and Faversham is currently the provincial house of the Order in Britain. 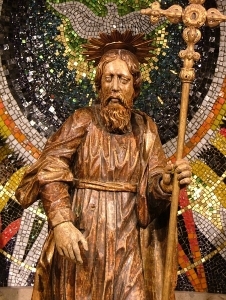 The parish of Our Lady of Mount Carmel has its own website and the Shrine of Saint Jude has its own section within this Carmelite website (click on the words in blue to access them). Also based in Faversham is the distribution centre for Saint Albert's Press which is the publishing house of the British Province of Carmelites.